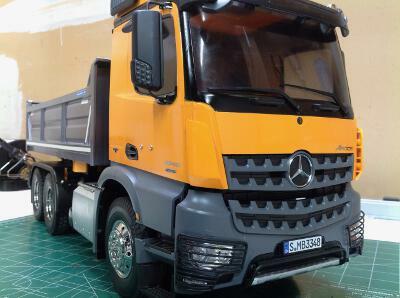 At the time I bought the Mercedes Benz tipper truck it had just been released and was therefore the newest 1/14 scale truck available from Tamiya. The fact that I had only one other tractor truck and it was the very oldest, the King Hauler, just gave a nice symmetry to my collection. 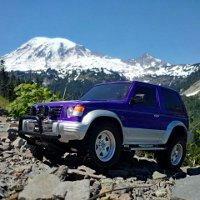 There are many things which haven't changed at all in all those years including the leaf springs, rear axle configuration, 3-speed transmission, wheels, and other chassis details. 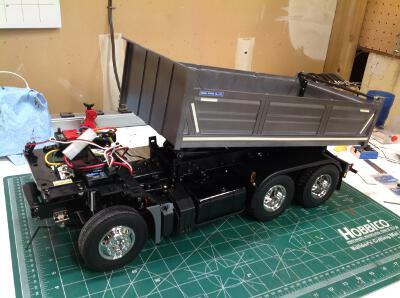 On the other hand, this is the first tractor truck to have a tipping bed rather than a 5th wheel and only the second Tamiya truck ever (after the 58268 Mammoth Dump Truck) with a motorized tipping bed. 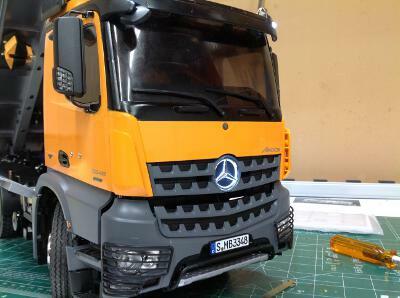 Mercedes Benz has been represented among the Tamiya tractor truck line-up almost from the beginning and comprises 6 of the 17 tractor trucks released as of 2018. 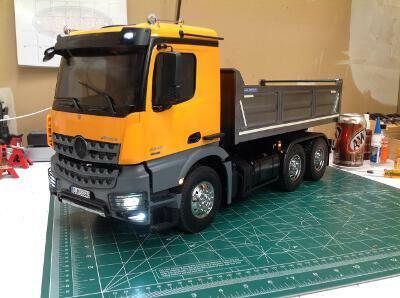 The tipper model is based on an Arocs 3348 6x4 configuration. Like the other tractor trucks, this is a leaf sprung model with a 3-speed transmission and solid C-channel frame. 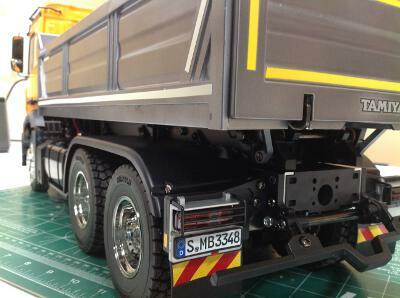 The rear two axles are driven and feature open metal differentials. It is provisioned for using the MFC (Multi-Function Control Unit) for lights, sounds, and vibration. Out of the box, the tipping bed is not functional but the model accepts the new ACU-01 control unit and electric screw actuator for remote control of the bed. Perhaps best of all, the model just looks fantastic. 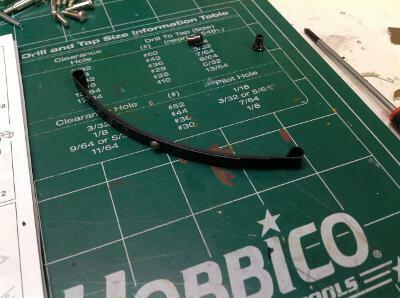 It is difficult to find anything Tamiya did wrong in the molds or details. The doors do not open but the cab tips forward to access the inside. An interior dash and seats are included, but they are not used if you install the MFC. Instead you can use smoke colored paint to tint the windows and effectively hide the wiring without totally blacking out the transparency. All of the older tractor trucks used a standard 27 turn silver can motor which makes the model much too fast, especially in 3rd gear. For this model, Tamiya uses a new "mighty tuned" motor with 35 turns which is much more reasonable (and also rebuildable). Even then, it is arguably still too fast. I use a 55 turn motor in my other trucks. I'm not a big fan of the monochrome gun metal finish of the box art, so I wanted to do something much more colorful. I ended up using Brilliant Orange which I thought was a good match for some European trucks I have seen. I didn't want to make the whole truck the same color, so I used a two tone with gray for the fenders and grille. I retained the gun metal color for the bed. 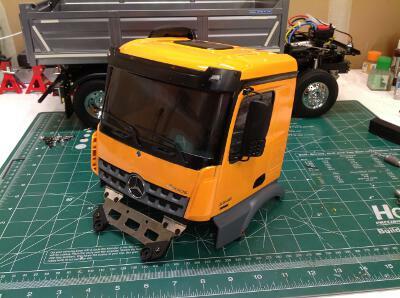 Since I've already fully documented a tractor truck build on my King Hauler page and the chassis is 90% similar, I'll be providing only a cursory overview of the build here. 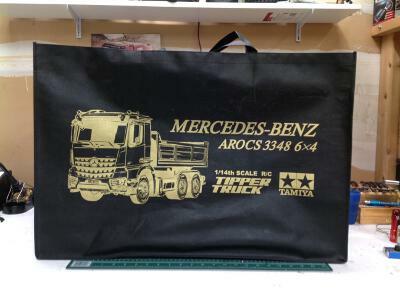 I don't know if every buyer got this, but my copy of the Mercedes Arocs 3348 Tipper came with this lovely bespoke carrying bag. The bag has to be huge to accommodate the huge box. It also includes carrying handles on the top. I'm not sure what I'm going to do with this bag after building the model, but at the very least it is a collector's item. 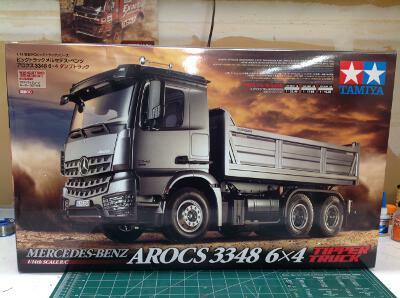 The front of the box doesn't have the typical Tamiya artwork but instead features a photograph of the truck on a simulated background. Lovely picture, but I am not a fan of the plain gray color. I'll be doing something more vibrant. The right hand image shows the inside of the box. 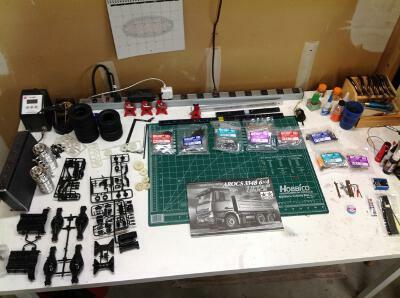 Like all Tamiya tractor truck models, the box is divided into sections roughly corresponding to body, chassis, hardware, and miscellaneous parts. The chassis rails are packed along the back edge for protection. 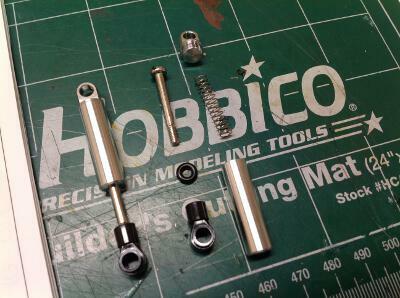 Here I've extracted the parts needed for the chassis. There are far too many parts (and my table is far too small) to unpack everything at once. 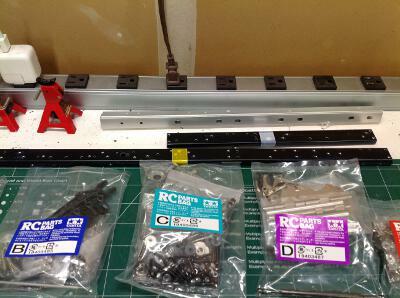 The right hand image shows some of the hardware bags and the aluminum chassis rails. 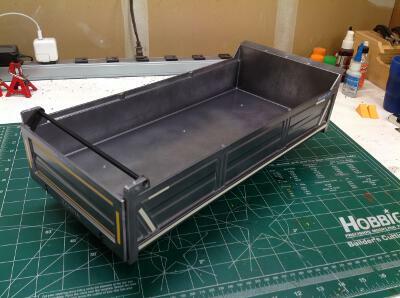 This model contains an extra set of shorter rails for the dumping bed. The metal shocks are internally sprung and undamped. They are really just for looks. They are identical to the King Hauler shocks except for color. The front leaf springs have 3 layers while the rear have 4. Makes sense for carrying a heavy load in the bed. While the King Hauler and other longnose trucks put both servos up front between the chassis rails, the European style cabover trucks put the steering servo on the side and connect to the front axle via an additional crank arm. 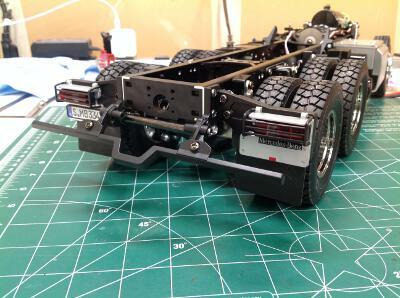 The front axle beam is metal on this model. The rear axle system is identical to the other 6x4 tractor trucks with metal differentials, plastic axle housings, metal bushings (instead of bearings), and shared leaf springs and radius arms. The 3-speed transmission is the same as that used in all the other 1/14th tractor trucks, but I couldn't resist taking a few redundant pictures anyway. 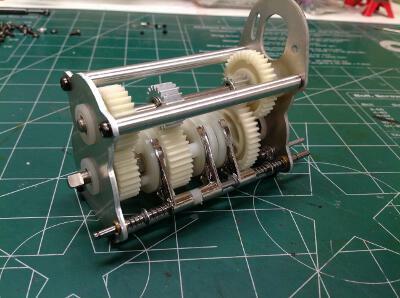 The smoothness and durability of this gearbox is a bit of a miracle. I can shift it under load at any speed with no problem and so far have had no failures. 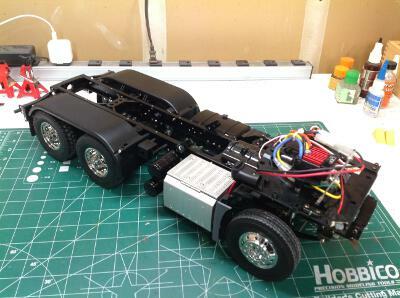 Most of Tamiya's tractor trucks come with a 27 turn "silver can" motor which is much too fast for a tractor truck, but this particular model comes with the new "Mighty Tuned" 35T motor which is much more reasonable, and rebuildable to boot. 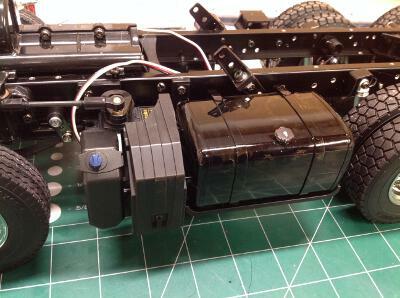 Here we can see the chassis before and after the drivetrain is installed. 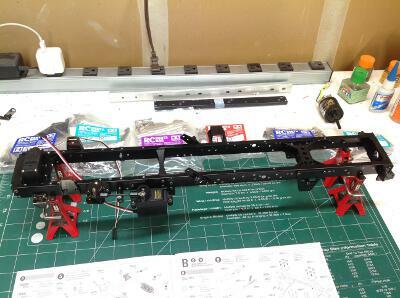 On the left is the frame with steering and shift servos attached as well as cross members and spring hangers. 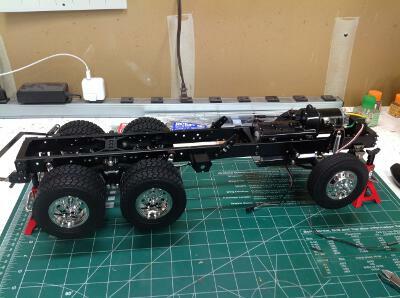 On the right the springs, axles, transmission, shocks, and wheels have been added. At this point temporary electronics can be installed and the rolling chassis can be test driven. 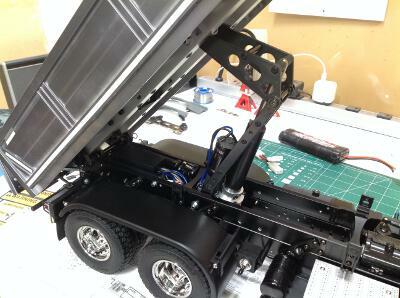 The rolling chassis was still pretty skeletal without any of the accessories installed, so we'll do that next. On the left side we put a large fuel tank, a battery box, and a water tank. The latter two are cut out in back to allow room for the servo and effectively hide it. Note the many different types of black finish here. The instructions call for black (gloss), semi-gloss black, and flat black. The difference in finish does a lot to break up the otherwise monotonous color palette. I think the silver box on the right side is intended to be the hydraulic pump and control system with attached reservoir tanks. 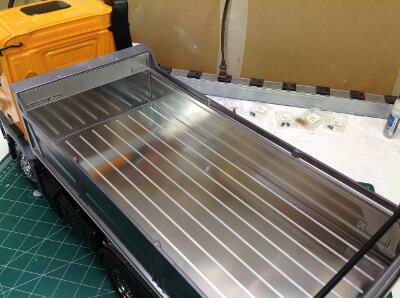 On the model, it serves as the home for the control panel if using the optional MFC. 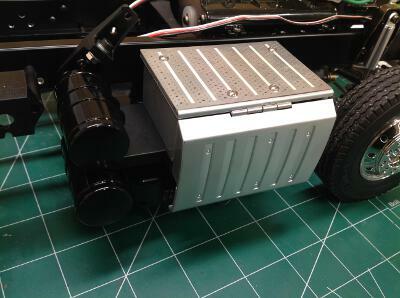 The battery holder is slung under the chassis between the fuel tank and the hydraulic box. This is a nice hidden location but makes changing the battery difficult since you have to access the bottom of the model but you can't set it on a table upside down. 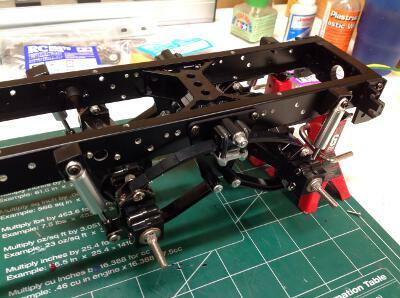 Here are some pictures of the completed chassis. On the left you can see the rear bumper along with the tail lights and mud flaps. 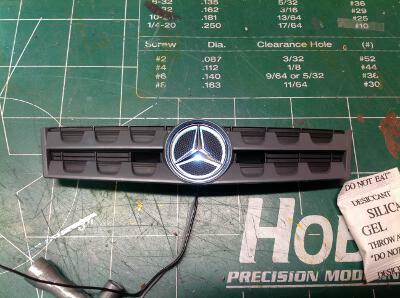 The thin plastic bumper is a bit of a problem since this is a natural lifting point for carrying the model but is not really strong enough to be used for that. The tiny plastic grate around the tail light lenses also requires care when carrying the model. Note the tread on the rear tires. These are an off road tread different than other tractor trucks. The front tires are normal. In the right hand image you can see that I've installed temporary electronics on the flat deck in front and also the rear fenders. I always intended to add an MFC, but I like to build the model in two stages just to see what it is like in stock form first. I've skipped forward quite a few steps here to the nearly completed cab. A lot of painting and masking is required, more if you want to do the model in 2-tone like I did. 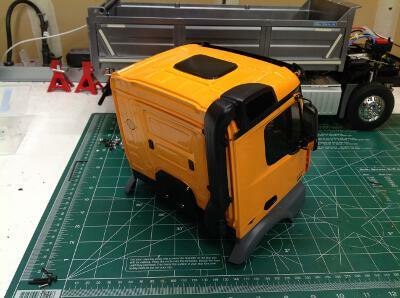 The main body is Brilliant Orange and the fenders and grille are German Gray. The accents on the cab and the exhaust are semi-gloss black. I put several coats of clear on when done. I started by painting the whole cab orange and then masked for the bulk of the black trim. I also did the windows in Smoke to hide the interior wiring. 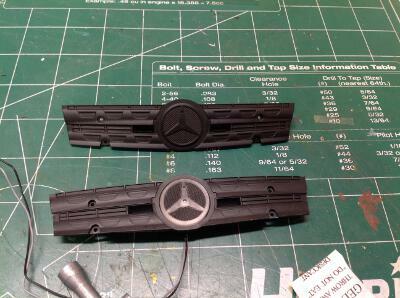 Most of the details are screwed together, but I was surprised to see that the front arches are actually glued. I worried that this would be a problem if running off road, but even though this is a dump truck it really doesn't have the clearance to run off road on anything rougher than gravel. Many real Arocs tippers paint the bed in the same color as the cab, but I wanted some contrast so I went with Bright Gun Metal which has a nice metallic hue. The bulk of the bed is a one piece plastic molding, but the rear gate and much of the underside reinforcement are separate parts. 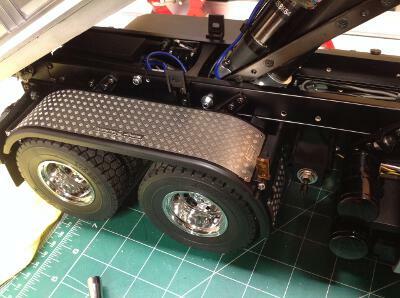 When viewed from the bottom, note the square aluminum extruded rails for bed stiffness. 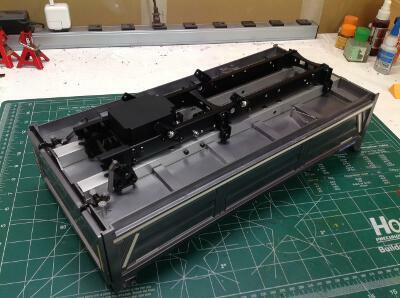 The black rails will be fixed to the chassis and the silver colored rails move with the bed. 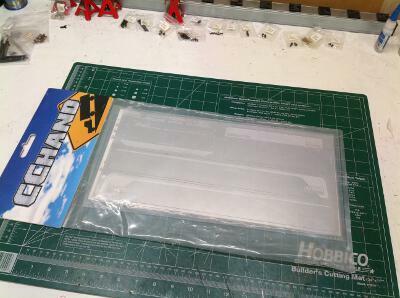 The plastic box you see is empty unless you add the powered lift system. Oddly, the instructions have you insert screws which lock the bed in the down position. You cannot lift the bed manually unless you remove the screws. 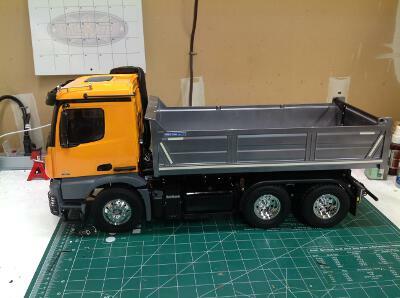 Here is the completed truck built per instructions without any additions or modifications (yet). It is really a beautiful and imposing model. 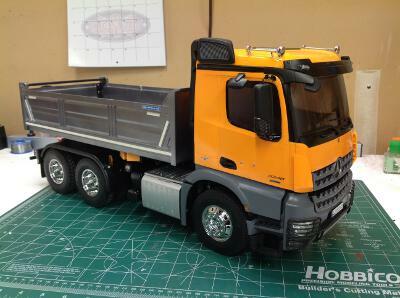 It is quite a long truck, but the wheelbase is slightly shorter than the King Hauler and much shorter than the Grand Hauler, but longer than other 6x4's like the Scania or MAN. Some detail views of the front and rear. 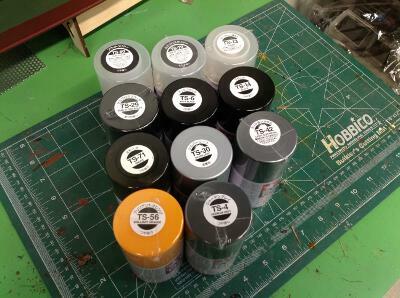 I used a LOT of paint colors for this model, although most of them are shades of black, gray, and clear. The right hand image shows the huge pile of empty parts trees as evidence of all the work that was required. There is an awesome truck. And it looks to be a longer and harder build than the aeromax. stingray-63 wrote: There is an awesome truck. And it looks to be a longer and harder build than the aeromax. Yes, there is more to it than the Aeromax, especially once you install the lift actuator. 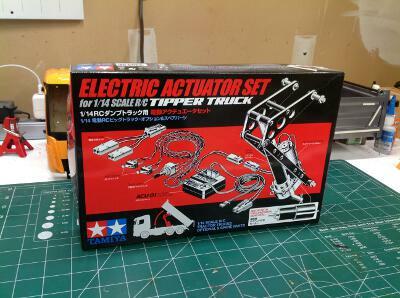 When this model was announced, I was surprised to hear that the tipping actuator was not standard. It is quite a shock to learn how much extra you have to spend to get this option, and you may not understand why it costs so much since it is "just a screw". 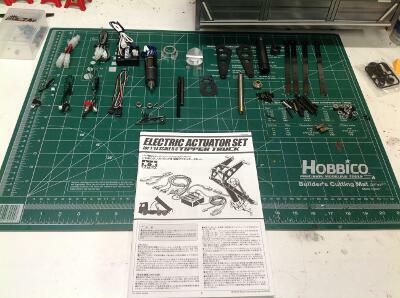 As you'll see below though, there is a lot involved in this optional actuator set, and many of the parts are steel or aluminum. 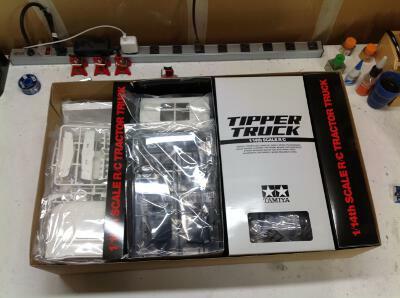 I highly recommend adding it if you own this truck since tipping the bed is the point of a tipper truck. Here's a good look at the contents of the box. There is a more here than you might expect. The actuator must be able to lie horizontally when retracted, but then pivot to vertical when extended. This is the only way it will fit between the chassis rails and also extend far enough to lift the bed. This requires a mechanism. 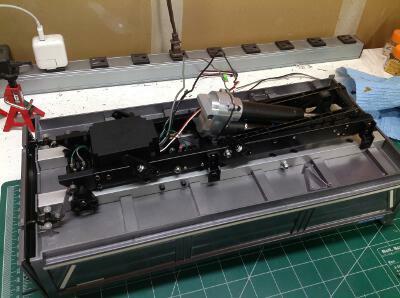 The electric motor must also be geared down heavily to lift the potentially heavy load in the bed. There is a control unit which takes the signal from either the radio or the manual switch and translates it to a command. Use of the manual switch will always move at full speed, while using the radio allows 3 speed options in each direction. There are also limit switches to stop the actuator when the bed reaches its end of travel. Without these, the huge mechanical advantage of the motor could damage the bed or the chassis running into the stops. The part you see on the left is the main drive screw and bull gear. If you look closely you'll see a ratcheting clutch built into the gear to protect the system from overload. The right hand image shows the main gearbox. 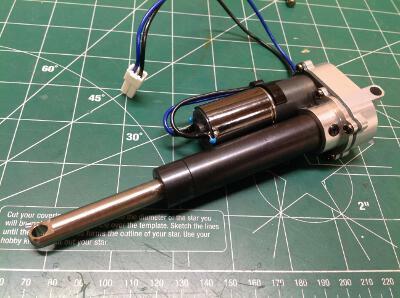 The small motor is at top left and is already connected to an inline gear reduction unit which results in a very slow output. 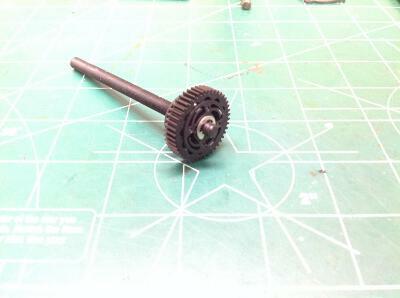 This thin directly drives a pinion which mates with the bull gear. The gearbox housing is aluminum but the screw appears to be steel (which makes it heavy). A thrust bearing sits at the end of the screw to support the axial loads of the actuator. 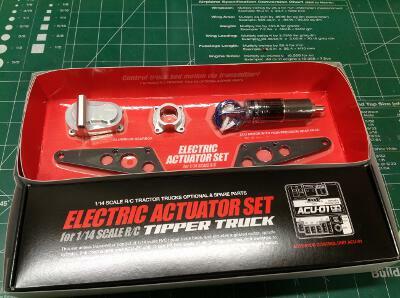 The traveling nut at the end of the rod is what extends the actuator. 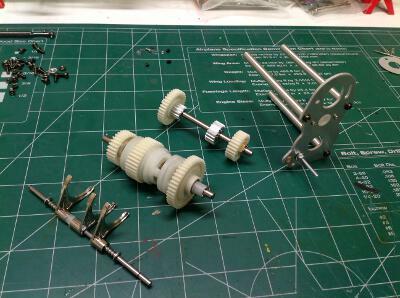 The screws fits inside when the rod when the actuator is retracted. The right hand image shows the cylinder (or barrel). This would be a pressure vessel on a hydraulic actuator, but here it really doesn't have any structural function. 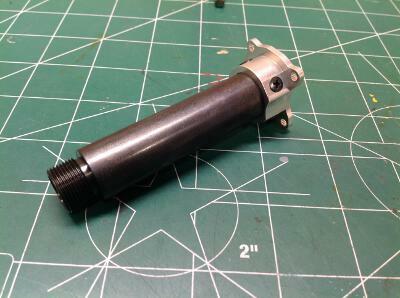 It makes the whole thing look like a hydraulic actuator and it protects the screw from dirt and debris. Awesome. But a hydrolic damper could be better. Especially due to tamiya price. stingray-63 wrote: Awesome. But a hydrolic damper could be better. 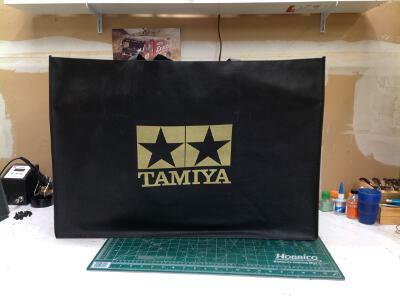 Especially due to tamiya price. I have some experience with hydraulic R/C and I'm not sure that would cheaper. Hydraulics come with a lot of overhead. 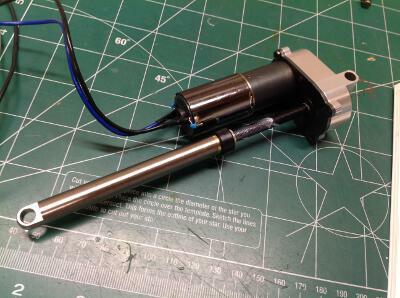 You'd need a telescoping actuator to fit, and then you need a reservoir, a pump, a pump motor, another ESC, a valve block, a servo, and all the associated tubing. That's a lot for only one circuit. It would probably lift a lot faster than the screw though. 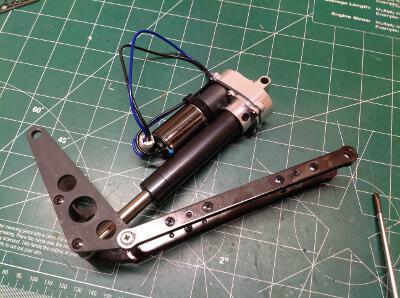 Here is the completed actuator with motor, gear reduction unit, gearbox, cylinder, screw, and piston. On the right you can see the steel plates which serve as links to control the kinematics of the system. 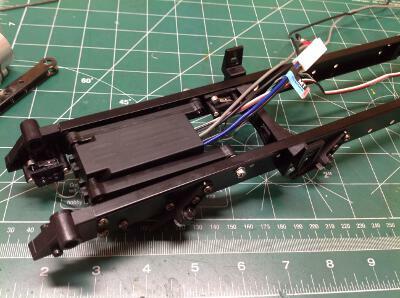 The upper end of the actuator connects to the links, and the lower end will pin to the chassis. 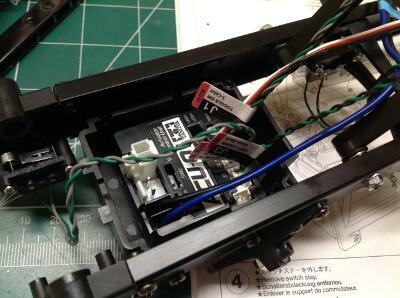 The control unit must be sandwiched into the plastic box between the frame rails of the chassis. Into this you must plug the motor, two limit switches, the radio connection, the manual switch, and power. If that sounds like a lot of connections, it is. It is tricky to get everything to fit in the box, especially if you'd like to coil up any extra wire length in there and not have to secure it elsewhere. 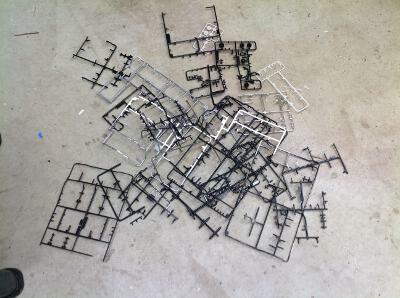 In fact, routing the wiring is probably the most complex part of the whole installation process. The actuator fills all the space between the rails and it is very important that the space be kept clear for movement. Any wires in the way will get smashed. Yet, power and signal clearly need to run forward, and so do any LED wires that might be going to the tail lights. 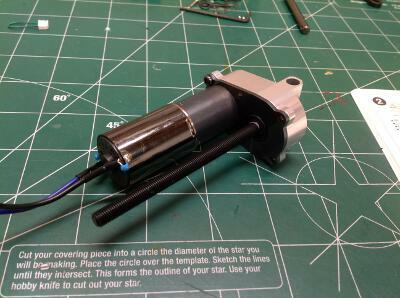 The wire going to motor must also be able to move through a large arc as the actuator extends. 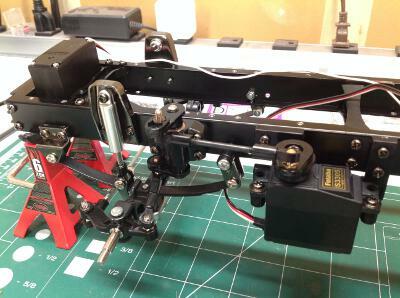 Here the actuator and the control box and installed to the bottom side of the bed. Everything is unsecured at this point and quite heavy, so the risk of pinching a finger is high. 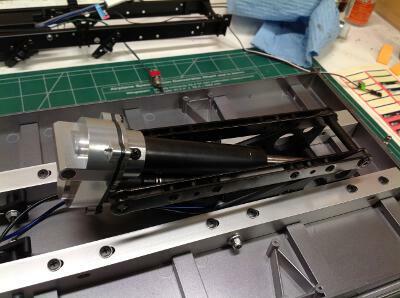 Here's the installed actuator in the raised position. Just behind the oil tanks on the frame rail you can see the switch for manually raising or lowering the bed. This will work whenever the battery is plugged in regardless of whether or not the ESC is turned on. This means you need to unplug the battery when not in use to avoid total discharge. 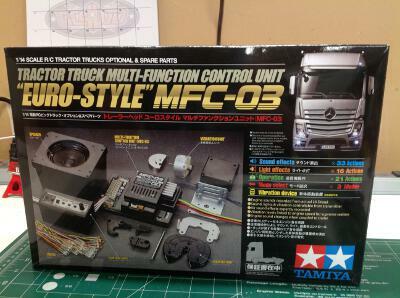 From the beginning it was a given that I would be installing the Multi-Function Control unit MFC-03 in this model. Since I've documented such an installation before, I won't repeat it all here. The control of the lifting actuator takes the place of the 4th channel previously used to detach trailers and control motorized legs. The little amber light ahead of the front wheel is not used per the instructions. The lens does have a light bucket, but I assume it is not used because it is too hard to get wires to this location with all the potential interferences in the lifting cab. I was able to solder up my own wiring to make it work. CChand makes some nice photo etched options for this truck. I didn't really like the stickers that came with the kit to install a diamond plate pattern on the rear fenders. I thought they looked much too fake. 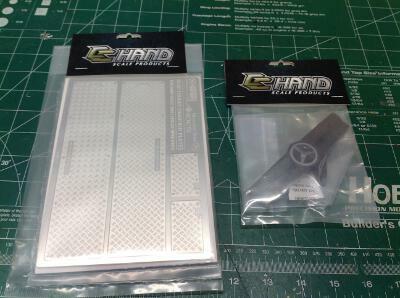 These metal parts, on the other hand, actually have a real textured diamond plate pattern and look awesome. 100x better. This compares the original grille center logo with the lighted version I got. You use the same chrome emblem in either case. There happened to be an open slot on the MFC which allowed for easy attachment of the lit logo which comes on with the fog lights. Here is the installed illuminated logo. I'm pretty sure the maker starts with an actual Tamiya part and modifies it with the light unit rather than making a new part from scratch. It fits perfectly, therefore. I vacillated on whether or not to buy this bed liner for a while because it is rather expensive, but it just looks so fantastic that I couldn't resist. It contains sheets for the bottom of the bed and all four sides including the rear gate.